Nationwide tank and pipe offers a full line of above ground polyethylene plastic tanks. Polyethylene is economical, impact resistant and chemical resistant allowing it to be used for various industries. We offer high quality plastic tanks built to a SG of 2.0. 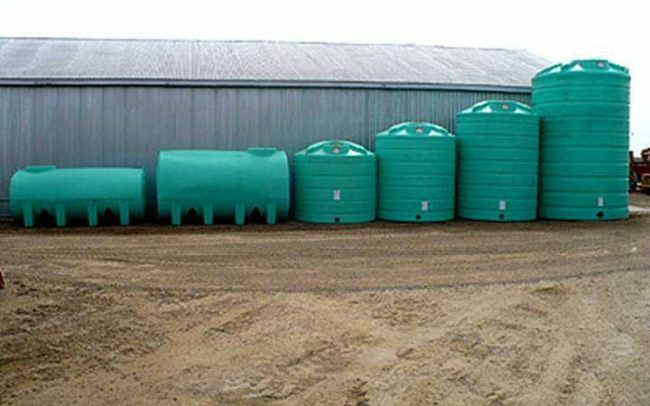 We offer vertical flat bottom tanks and cone bottom tanks. Our thicker walled construction and higher quality poly materials ensure you are purchasing a superior plastic tank. Design Suitability – Nationwide Tank and Pipe’s Research Center will work with each customer to ascertain what liquid is intended to be stored so that an appropriate tank design package is recommended to suit the liquid being stored. Cost Savings – Composite fiberglass tanks are a more cost effective solution than a variety of other forms of tanks as they have a lower initial purchase price and then provide a longer service life by avoiding resurfacing costs and downtime. We offer our tanks in 6 standard colors, being Brown, Black, White, Desert Tan, Dark Green and Battleship Grey. A range of specialty colors is available to suit customer requirements and company corporate colors. We are able to supply our tanks with a variety of fittings to meet our customer’s specific requirements. We work with each customer to determine their needs to ensure that the tank performs as required. We are able to provide tanks with flanges. Flanges are available in standard sizes of 1″, 2″, 4″, 6″, 8″,10′, 12″, 16″, 18″. Custom sizes can be ordered to meet your requirements. We are able to provide tanks with couplings. Couplings are available in standard sizes of 3/4″, 1″, 2”, 3”, 4”, 6”, 8”. Custom sizes can be ordered to meet your requirements. We are able to provide tanks with Manways. Our standard Manway size is 24″. We are able to customize tanks with a 30″ Manway. Nationwide Tank and Pipe manufactures a large number o f tanks that are used to store water for a variety of applications. Nationwide Tank and Pipe knows that static risk is a customer consideration when choosing tank options. Many customers are not concerned about static risks; however, experienced or concerned customers can rest assured that Nationwide Tank and Pipe does have two cost effective static mitigation options available. The first option is building into the tank a carbon veil with a grounding bolt. We build into the tank a liner of carbon that wraps around the tank from the top of the tank to the bottom and then attaches to a grounding lug. This grounding lug is then attached to an earthing rod when the tank is installed to assist in dissipating the static electricity. This system is very effective in drawing charges from the tank shell itself and marginally effective at removing charges from tank fluids and vapors. We also recommend reading the article below. Lightning and Static Protection: Can fiberglass Tanks Surpass Steel Tanks? In Rusk County, Texas a lighting strike caused a steel oil tank to catch fire on July 6, 2012. Officials say the lighting strike caused the tank to fly into the air and land on an un-occupied mobile home at least 100 yards away. At the height of the storm, investigators say a lighting strike hit an oil tank, causing it to erupt into flames. The blast sent the 300 barrel steel tank over 100 yards, landing on a mobile home and splitting it in half. No other structures were damaged and no injuries were reported. This is just one example of a steel tank catching fire as a result of a lighting strike. Many steel tank manufacturers would have you believe that only fiberglass tanks catch fire, unfortunately the risk of fire is a risk for both steel tanks and fiberglass tanks. Accordingly, Nationwide Tank and Pipe LLC recommends that it customers look to various lighting and static protection options to reduce the risk of lighting and static fires.